Kayaking can be a fun, exciting and healthy activity, but it isn’t something you want to dive into head first without knowing what you’re getting into. 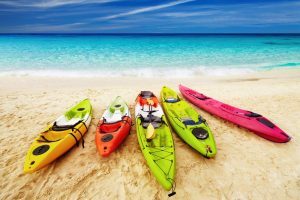 If you are new to kayaking and want to get your feet wet then this article will help you navigate the sport and choose the best kayak for beginners. We are going to cover the factors that you need to consider when choosing your first kayak as well as where to buy kayaks. Then, we will discuss the top 10 best beginner kayaks in 2019 complete with the specifications, benefits and drawbacks of each option. 4 Which Beginner Kayak Should I Choose? 1. Age – How old are you (or the person for whom you are purchasing the kayak)? A child or teenager won’t be able to use the same kind of kayak as a fully grown adult, for multiple reasons. 2. Body of Water – What type of conditions do you expect to encounter when kayaking? Are you planning on kayaking in a calm pond or lake, or do you plan on hitting the open ocean or a fast moving river? 3. Sit in or Sit on – Kayaks come in two basic styles. Some kayaks allow you to sit inside the hull and you’ll be seated in a lower position. Other kayaks’ seats are designed so that the user sits more or less on top of the kayak. You can store more gear in a “sit in” kayak and you’ll stay drier. You will also have greater control over a “sit in” kayak due to the lower center of gravity. “Sit on” kayaks will allow you to get more sun and are more suitable for fishing. To put it simply, “sit in” kayaks are more useful when kayaking is the main activity in which you plan to engage, while “sit on” kayaks tend to be used by kayakers who are taking a more relaxed approach to the water. 4. Number of People – How many people are going to be using the kayak at once? If you are a lone wolf then a single seat kayak should work just fine, but if you have a friend, spouse, children, etc. who may be joining you in the kayak then a multi-seat kayak would probably be more appropriate. 5. Turning vs. Tracking – Tracking refers to how adept a kayak is at staying in a straight path. As a general rule, kayaks that track well don’t turn as well, and vice versa. Knowing the routes you plan to take while in the kayak will help you choose the best module for you. 6. Stability – Two forms of stability exist when considering kayaks. 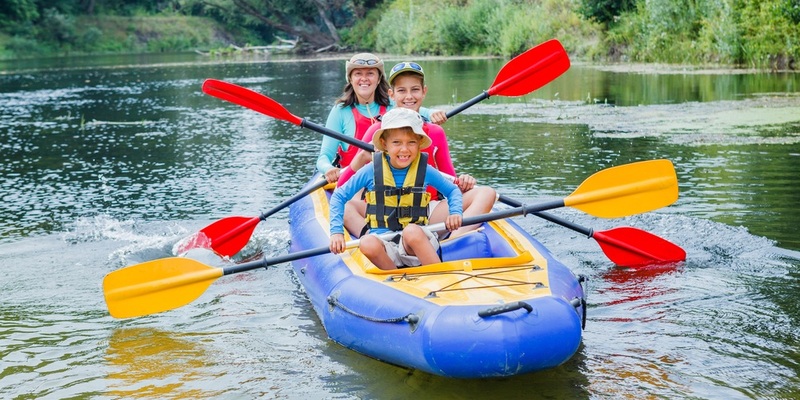 Primary stability refers to how stable a kayak is when sitting still or engaging in low motion activities, as well as when you are entering or exiting the craft. Secondary stability is the stability of the kayak when you are encountering high motion activities such as speed kayaking and white water kayaking. 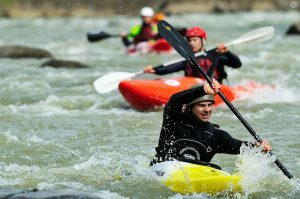 As is the case with turning and tracking, kayaks with high levels of primary stability are often not great when it comes to secondary stability, and vice versa. 7. Material – There are seven main materials from which kayaks can be made. They are hard plastic, inflatable plastic, carbon fiber, Kevlar, fiberglass, wood, and fabric with a frame. The vast majority of kayaks are composed of hard plastic or fiberglass. Plastic is heavy but resistant to damage. Fiberglass is lighter but more expensive. Kevlar and carbon fiber are even lighter but are also more expensive. Fabric/frame kayaks are light and collapsible but they are also expensive. Wooden kayaks are extremely rare these days due to their weight and their high manufacturing costs, and inflatable kayaks are better suited for rapid water conditions because they do not track very well, thus allowing the water to direct you. 8. Purpose of Kayak – Are you looking to get wet and wild in some Stage 4 rapids, or do you want to relax on the lake while doing some fishing? Are you looking for a kayak so you can do some bird watching, or are you planning on taking a leisurely ride down a deep, slow moving river? Knowing exactly how the kayak will be used is vital when selecting a kayak for beginners. 9. Rigging – Many kayaks offer accessory rigging that can be useful in certain conditions. Deck netting is useful for storing small items, for example, while safety lines can come in handy for kayaks used in open waters. A shock cord can be used for keeping important items close at hand, and paddle float rescues are a smart investment just in case you encounter volatile waters. 10. Hatches – Hatches are designed for storing items that you can’t afford to get wet due to potential water damage (i.e. cell phones, food, clothing, etc.). While hatches are ideally waterproof it’s important to note that a roll or rough conditions could subject your items to moisture, and depending on the conditions some hatch covers can be compromised. 11. Rudders & Skegs – Rudders and skegs can help you steer your kayak by means of a foot pedal. If you are using a log kayak or expect to be in open waters then rudders and skegs are almost necessities, but kayaks used for more casual purposes may not need such equipment. At the end of the day it’s vital to know how to control and steer your kayak without rudders or skegs because such additions can become damaged quite easily. 12. Weight – Most of us will eventually (if not regularly) have to carry and/or store our kayaks, so weight is a big issue. Even if you have a kayak cart it’s probably a good idea to know your limits when it comes to weight, especially when it is time to place your kayak in the water and when you’re removing it from the water. 13. Cost – The cost of a kayak is a huge issue for many people, especially those who are new kayakers. The price range of kayaks is massive, with cheap kayaks costing less than $100 and advanced kayaks costing more than $3,000. Consider your budget as well as your kayaking needs when shopping for kayaks online or at retail stores. The list of places where one can buy a kayak for a beginner is both extensive and exhaustive (literally!) so we won’t get into specifics when it comes to retail store names, website URLs and other locations where you can find the right kayak for you. Instead, we’ll briefly list a few options and let you navigate the online and retail waters on your own. Amazon is a very popular place when it comes to buying kayaks. Amazon has an extensive selection and the customer reviews make it easier to know what to expect. 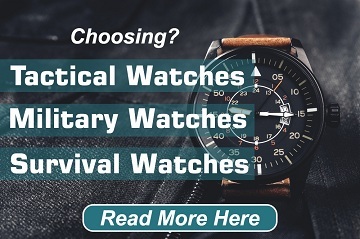 You can also check out eBay, REI, Bass Pro Shops and Craigslist. Our advice, since you’re new to kayaking, is to speak with friends that are avid kayakers. They can advise you on where they shop for kayaks and kayaking accessories, and if you tell them a little bit about your plans then they can likely point you in the right direction. Specs – This sit-in kayak is 10 feet long and is made of high-density polyethylene hard plastic. It has a narrow stern and bow and weighs 40 pounds. It is 30 inches wide and has a two-year warranty. It has a flat bottom and can support up to 250 pounds. It features adjustable foot braces, a high back support and a storage compartment directly behind the seat. Pros – You will almost never have to worry about this kayak breaching because it is extremely durable. For a hard plastic kayak this model is extremely light. It tracks very well thanks to the sleek design; the narrow width and flat bottom make it a great kayak for beginners. It’s very comfortable to sit in and the adjustable foot braces make it easy to paddle. Cons – The seat isn’t padded which could to lead to some discomfort during long or rough outings. The storage compartment is smaller than those found in other types of kayaks, but if you don’t have a lot of items to store then that shouldn’t be a problem. If you’re taller than 5’8” then you might have some difficulty using this kayak due to its size. Specs – The Ocean Kayak Malibu Two is a tandem kayak with adjustable seats. This sit-on kayak is made of a hard, molded, polyethylene shell and it is 13 feet, 4 inches long from stern to bow. At its widest point it is 34 inches, and the kayak itself weighs 68 pounds. There is open-air storage on both ends, with each of those compartments having a bungee cord to secure larger items. There are waterproof storage containers in front of each seat for storing smaller items. This particular model has a skid plate, paddle holders and side-mounted carrying handles. There are also four foot well positions for each leg, and the kayak has a maximum weight limit of 425 pounds. Pros – Taller kayakers will really appreciate the leg room available. Additionally, the seats have three different positions so you can kayak alone, with a partner, or with a partner and a small child. The price is very reasonable for a two-person kayak, and beginners will appreciate how wide and stable the Malibu Two is, not to mention the fact that it tracks incredibly well. Cons – It isn’t exactly easy to carry this kayak alone or on rough terrain, as it’s pretty wide and it weighs 68 pounds. However, there is no denying that the handles on the side make carrying this 13-foot kayak somewhat easier. Other than that and the fact that a very small number of people who submitted reviews only claimed to suffer from scupper hole cracks there is nothing negative to say about the Malibu Two or Malibu Two XL from Ocean Kayak. 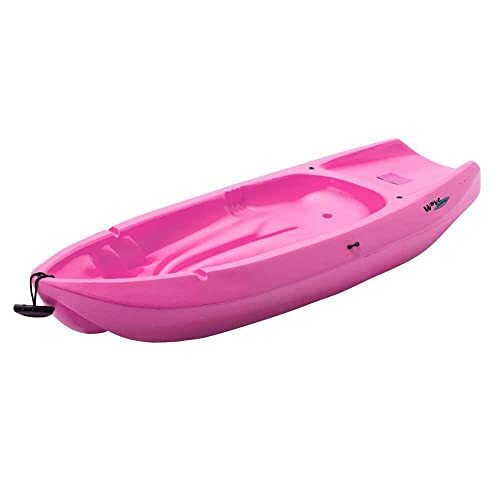 Specs – This hard plastic (the shell is made of polyethylene) one-person kayak has a waterproof storage unit in front of the seat and additional storage space (complete with bungee cord) directly behind the seat. A rod holder is mounted onto the kayak, and the seat is both padded and adjustable. This model uses a V-type hull, and it weighs approximately 60 pounds. The Pescador 12 is 12 feet long and can support up to 350 pounds. Its exact dimensions are 144” x 28” x 13.75”. Pros – This is a great kayak for beginners because it is very easy to enter and exit. It tracks well and it is also an excellent kayak for teaching new kayakers how to turn and maneuver. This model is available in several different colors, and it is comfortable to sit in while extremely durable on the outside. 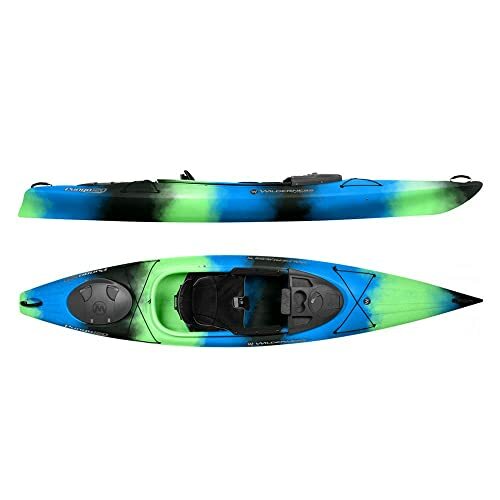 Two other major benefits of this kayak are that it is very stable while moving and while at rest, which is rare, and that it is relatively affordable compared to some of the other best beginner kayaks on this list. Cons – Coming in at 60 pounds, the Pescador 12 is something of a heavyweight. Additionally, for a hard plastic kayak it does fall into the medium-high price range for beginner kayaks. Other than those points and the occasional mishap due to dragging or vendor/delivery company shipping problems customers seem to not have anything else negative to say about the Perception Pescador 12 so far. Specs – The 2017 version of the Hobie Revolution 13 Mirage Drive 180 kayak has dimensions of 13’5” (length) x 28.5” (width) and it weighs 69 pounds. It’s made of hard polyethylene plastic, and this sit-on kayak seats one person. It has a flat hull and can be propelled using a pedal and a rudder due to the Mirage Drive 180 system. It has two eight-inch sealed storage containers and a hatch in the bow. Additional storage includes two mesh pockets, two rod holders and on-hull paddle storage. The rear of the boat also has a cargo area with bungee cords. There is also a sail mount and a way to remove and store the rudder. The maximum weight capacity for this kayak is 350 pounds. Pros – We’ll try to keep things brief, but be aware that doing so is going to be difficult when talking about the advantages of the Hobie Revolution 13. This kayak has more than enough storage space for everything you bring, and the rod holders and paddle storage unit give you even more space. The Mirage Drive system lets you go forward or backward without using a paddle so you can have your hands free for other activities. This kayak is the epitome of versatile as you can use it for lake or pond fishing, sailing and even in water that’s rougher than normal. These are only a few of the highlights offered by this kayak and you really need to rent or buy one to experience all of its benefits. Cons – The hull of this kayak weighs just over 69 pounds, and if you factor in the seat and Mirage Drive system you’re looking at 80+ pounds. This is definitely on the upper side of the weight range for a kayak with a single seat, so it will help to have a cart (or a friend) when transporting the kayak. If you’re on a tight budget then this kayak might be out of your price range, but if you can afford it this kayak is great for beginners because it is so easy to board and dismount, and the Mirage Drive propulsion system alone makes this kayak worth the money to a lot of people. Specs – The Tarpon 100 is 10 feet long and 30.5 inches wide. It weighs approximately 55 pounds, and this one-seat, sit-in kayak is made of high-density, hard polyethylene plastic. It has a weight capacity of 325 pounds and it has a molded-in storage well in the stern that comes with a bungee cord. There are also 8” storage hatches in the bow and in the midship area. 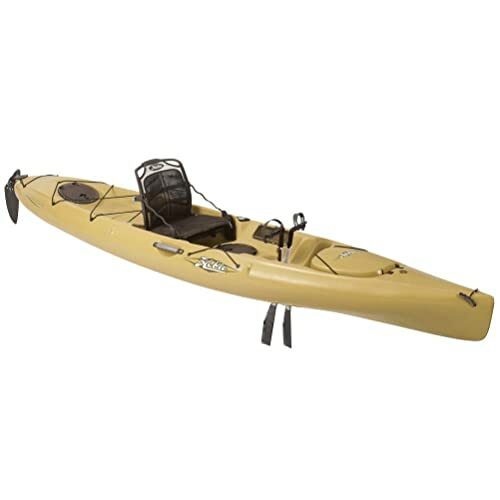 This kayak utilizes the Phase 3 Air Pro seat and the Keepers XL foot brace system. This kayak has carry handles on the sides and at each end. Pros – The price point of the Wilderness Systems Tarpon 100 is better that expected for a kayak of this quality. The molded-in tank well in the stern is generously large and more than enough space to carry a bag of dry goods or even a cooler. The cup holder and storage pockets are easily accessible, and this kayak is a triple threat of tracking, turning, and speed. And even though this model is 55 pounds it’s easy to carry thanks to the cushioned carry handles. This kayak also has self-bailing scupper holes and gear storage pockets. Cons – At 55 pounds this kayak is heavier than most one-person kayaks. The two Orbix storage containers are great, but they only fit items smaller than eight inches. One other small annoyance is that although this kayak has scupper holes it does not have a drainage hole in the seat. This means that any water that collects in the seat will need to be dumped out or dried. Specs – This inflatable, one-person sit-on kayak is approximately nine feet long and three feet wide. It can support up to 400 pounds and uses double-lock valves. It has carry handles, cup holders and secure storage areas. The kayak is comprised of 21-gauge PVC and the bottom is reinforced. The detachable seat has a backrest and there are multiple foot pedals to accommodate kayakers of different heights. Pros – This kayak is super mobile, and I love how the carry bag also functions as the seat. It only takes five minutes to set the kayak up and get it into the water, and the AirTight system prevents leaks. The hand pump is easy to use, and the 400-pound weight limit is impressive, to say the least. 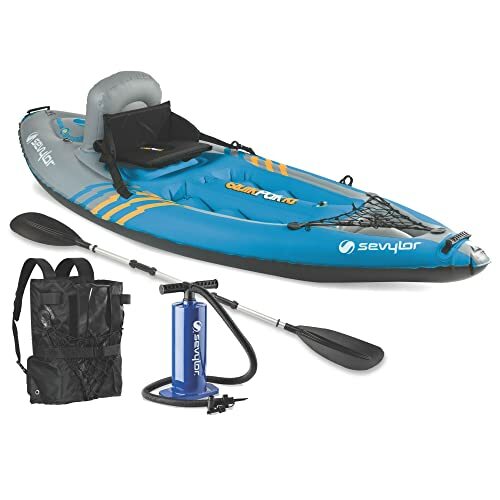 To top it all off, the Quikpak K1 by Sevylor is one of the most affordable inflatable kayaks for beginners that is available to buy online today. Cons – This is definitely a recreational kayak for beginners and not something that you’d want to hit the rapids with. The kayak is covered by a warranty but that warranty is only a three-month limited warranty, which is somewhat disappointing. You also need to check for any damage to the kayak when you receive it, just to make sure there was no damage during shipping. 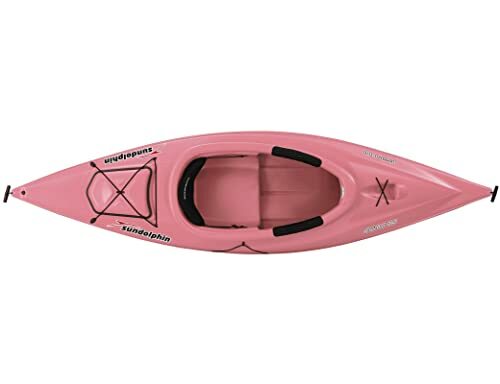 Specs – This youth kayak is designed for beginning kayakers who weigh less than 130 pounds. This sit-on kayak is six feet long and nine inches deep, and it has molded handles on both sides and at each end. The kayak weighs 18 pounds and has a 5-year limited warranty. The hull is made of UV-protected, high-density polyethylene plastic, and it has multiple footrest positions for kayakers of varying heights. It has a swim-up deck design, a reverse chine, and self-draining scupper holes. Pros – If your child is ready to begin paddling on their own but they are too small to control a regular-size kayak then this is a great solution. The kayak is easy to maneuver and it tracks well. The kayak isn’t heavy at all, and the swim-up deck design makes it easy to get into the kayak from the water. This is an extremely affordable way to improve your beginning kayaker’s skills. Cons – For the purpose it’s meant to serve the Lifetime Wave youth kayak is pretty reliable. 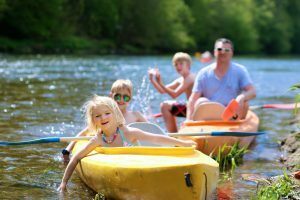 The main drawback of this model is that children grow quickly, so it may not be long before you need to purchase a full-size kayak or a tandem kayak. Additionally, this kayak can only be used in calm waters, and even then you will want to keep a close eye on your child. Specs – This sit-in, one-person kayak is 12 feet long, has a width of 29 inches, and weighs 49 pounds. It’s made primarily of molded polyethylene and has a v-shaped hull bottom. It features a storage compartment immediately behind the seat, and the bulk heads are located at the stern. The cockpit is 57” x 22” and this kayak uses a mesh/suspension seat. It has a maximum weight limit of 325 pounds, and it’s important to note that it has a multi-chine hull. It has carrying handles on the front and the back, and there is also an open-air storage unit with a bungee cord for larger items. 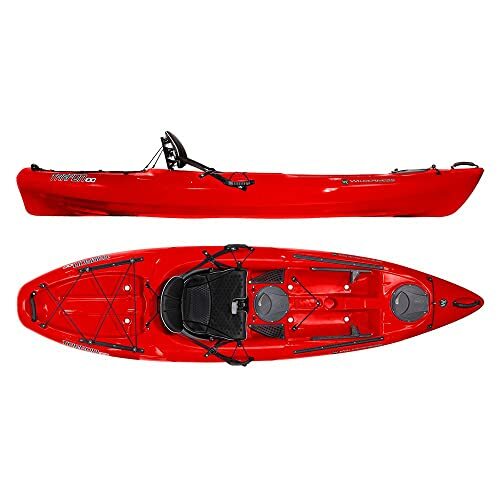 You can also add/remove the Kayak Konsole for added convenience and storage, and the Phase 3 Air Pro seating system has a 6-way adjustment mechanism. Pros – Beginning kayakers of all sizes will appreciate the Phase 3 Air Pro system as it allows for much more room in the cockpit. As a matter of fact this model has one of the largest cockpits of all sit-in kayaks available today and it allows for use of a spray skirt. This kayak tracks extremely well, and it’s easy to turn. The padding on the seat is designed to add more support where your body needs it, and the result is one of the most comfortable kayaks I’ve ever used. Another benefit of this kayak is the hard shell because it is damage resistant even on rough bottoms or shores. Cons – This boat isn’t known as a speedster, so if you’re looking to get across the lake in a hurry then you might want to consider other options. Depending on where you buy this kayak it can be somewhat expensive, so shop around before pulling the trigger. Although this kayak is known for being stable in calmer waters, you probably don’t want to approach anything higher than a Class 2 rapid with this particular model. Specs – This sit-in, one-person kayak is made of ABS plastic and weighs 41 pounds. This model is 12 feet long and can support up to 295 pounds. It has a fixed seat, and the cockpit’s dimensions are 35” x 18.5”. According to the Eddyline website you can get the Skylark with thigh braces, and it’s rated as having high levels of both primary and secondary stability. Pros – The Eddyline Skylark is great for beginning kayakers who plan to take on rough waters. The material from which this model was made is both durable and lightweight, which in the kayaking world means long-lasting and easily mobile. The kayak’s design makes it very maneuverable and your low center of gravity will allow you to get great results when paddling rapidly. It’s rare to find a beginner kayak that tracks well and turns easily, but the Skylark fits the bill. Cons – This model doesn’t have an adjustable seat, and there are more than a few people who gave this kayak 4 stars instead of 5 because they felt that the seat was uncomfortable. This is a great beginner kayak but only if you aren’t willing to shell out a little bit more money for a superior product. The handles are kind of awkward at first, too, but it didn’t really bother me at all after a few minutes. The material will show wear and tear after a lot of use but it’s merely aesthetic; this model holds up really well over time. 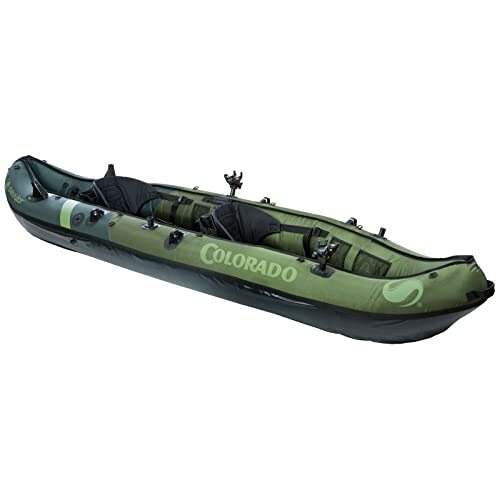 Specs – This two-person inflatable kayak has multiple air chambers and has a one-year limited warranty. It comes with a carry bag and a pressure gauge, and its inflated dimensions are 10’ x 9’ x 3’3”. It can hold up to 470 pounds and has adjustable seats. This sit-on kayak includes mesh storage pockets and paddle holders, and it uses a Boston value for inflation/deflation. This kayak is trolling motor-compatible and it also has fishing rod holders included. It is composed of 18-gauge PVC plastic and features a 1000D tarpaulin bottom as well as 840D nylon. Pros – The addition of multiple air chambers protects your kayak from punctures. The bottom of this kayak is more solid than rock and the PVC is incredibly high-quality and sturdy. It’s incredibly easy to inflate and deflate, and it includes a pressure gauge that you can use to monitor air pressure during inflation. This model has more than enough safe to fit two people comfortably, and the kayak is lined with multiple mesh storage pockets. Cons – The downside of inflatable kayaks is that when something like the seat gets work out you can’t simply buy a replacement. Fortunately this is a very affordable kayak for beginners, and if you take care of the kayak appropriately you may never need a replacement. Another drawback is that this kayak doesn’t have a reliable waterproof storage unit, so you’ll probably want to avoid any heavy rapids or fast-moving water. 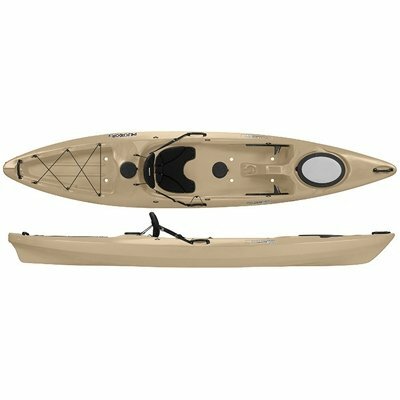 Which Beginner Kayak Should I Choose? All kayaks are not created equal, and the kayak you choose should reflect what you plan to do in the water. If you plan on hitting some of the rough stuff then a couple of good options are the Sun Dolphin Aruba, the Eddyline Skylark and the Pungo 120. Youths who are beginner kayakers should consider the Lifetime Wave (younger children) and the Sevylor Quikpak K1. If fishing is your end game then kayaks like the Hobie Revolution, the Perception Pescador (“pescador” means “fisherman” in Spanish) and the Coleman Colorado. Kayakers who will be paddling with a partner will also appreciate the Colorado as it is a two-seat kayak, as is the Ocean Kayak Malibu. If you prefer sit-in kayaks then the Tarpon 100, the Eddyline Skylark, the Pungo 120 and the Sun Dolphin Aruba are all viable options, while those who prefer sit-on kayaks for calmer conditions may want to look more closely at the Hobie Revolution (especially if you don’t like paddling because it has a foot pedal propulsion system), the Coleman Colorado, the Perception Pescador and the Malibu by Ocean Kayak. Are you ready to hit the water? It’s not a coincidence that kayaking has grown so much in terms of popularity over the last 20 years. It provides kayakers with the ability to enjoy the outdoors, get exercise, increase muscle mass and get some adrenaline flowing. Kayaks are also extremely useful tools when it comes to fishing, bird watching and other fun outdoor activities. We hope this article has helped you come to a better understanding of what it takes to select and buy a proper kayak, and we’d love to hear how this article has benefited you personally. Additionally, if you have any kayaking suggestions or would like to recommend (or provide a warning about) any specific kayak then we and our readers would love to hear from you in the Comments sections below. Any idea what brand/model is pictured (blue one with the woman and her two kids)? Thx.